Leather furniture can be timeless, trendy, traditional and “today”. It’s always going to be an interior design staple regardless of your personal style, so if you haven’t embraced the look already, you might want to consider doing so. Leather is stylish, yet comfortable, and it provides excellent texture to a room. While it might be a bit pricier than fabric covered furniture, a leather sofa, treated properly, can outlast the lifetime of three fabric covered sofas combined. Buy a piece of leather furniture in a timeless silhouette and you will only need to switch out your pillows, blanket throw or surrounding decor to change up your look for years to come. Another bonus? Leather is up to four times more durable than fabric. It improves with age, just like a bottle of wine or a pair of leather shoes. You’ll be making an investment when you choose to go this route. Upkeep is also easy! Unlike upholstery, the color of the leather won’t affect day to day maintenance. Just use a damp cloth to wipe away dust or dirt. Not all leathers are created equal. For instance, full grain and top grain leathers are both high quality, but one is definitely superior to the other. Full grain is the highest quality leather on the market. It comes from the outermost section of the hide and is the most sought-after grain. The fibers in the grain allow it to retain its strength, durability and character because it hasn’t been sanded down to remove imperfections. Top grain is still very high quality, but it is definitely second tier. It is sanded down to remove scars, light branding marks and blemishes and then imprinted with imitation grain to give it a more uniform look. Genuine leather is the third grade of leather. It is comprised of the layers of hide that remain after the top hide has been split for better grades (full grain and top grain). It is often refinished to look like higher grades and it can be smooth or soft in texture. Suede falls into this category. The final grade is bonded leather. Warning: Stay away from bonded leather if you can! This is the worst quality on the market because it is made of leftover scraps that are ground together with glue and resurfaced in a process similar to vinyl manufacturing. This type of leather is weak and degrades quickly with heavy use. When choosing leather for your cushions or furniture, try to add a zipper to the back of the seat cushions. The interior foam will probably not last as long as the leather, and you’ll want to be able to easily replace the foam or cushion inside. Occasionally remember to clean and moisturize your leather with a leather specific cleanser and moisturizer to keep it soft and to extend its lifetime. Don’t use oil soap, soap or detergent on your leather. Doing so may darken it, change the color or dry it out. Don’t leave wet items on the leather furniture for long periods of time. Doing so may damage it by leaving a water stain. Be sure to keep sharp objects from puncturing your leather. It’s best to keep sharp objects away from your leather in general. Gently dab away spills with a clean terry cloth or paper towels. If you spill oil or grease, use talcum powder or baking powder to absorb the stain. At our store, Fabric Depot, we have many different types of leather in stock. 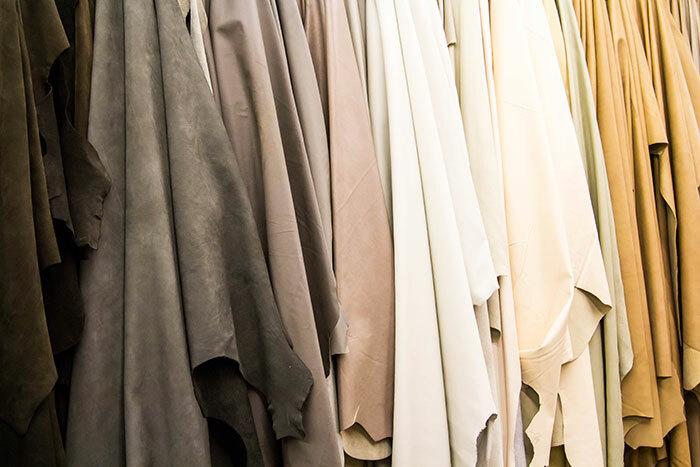 Our supply includes quality leather hides (full grain and top grain and suede), calf skins, sheep skins, hair-on-hides and more in various grains and colors. You can use these to upholster furniture, cover a pillow, as an area rug and many more decorative ideas. Are you a fan of leather furniture? How do you style yours?